We are approaching those days when shopping turns into real madness, when everybody is shopping just for the sake of buying new goods on Black Friday. Today I came upon this amazing watch deal at eBay for a men's watch with huge discount - Invicta 17204 Aviator. That is a very stylish chronograph watch with steel bracelet and the advertiser claims they give over 90% off the original retail price. Honestly, I am not quite sure if that is the real discounted price since I saw the very same model at Amazon for almost the same price, even a bit cheaper - offered $82 at eBay and $72 at Amazon (that is the cheapest I could find). "Invicta 17204 Aviator chronograph men's watch features a 48 mm wide and 13 mm thick two tone gunmetal ion plated solid stainless steel case with a fixed bezel and textured push-pull crown with function pushers. 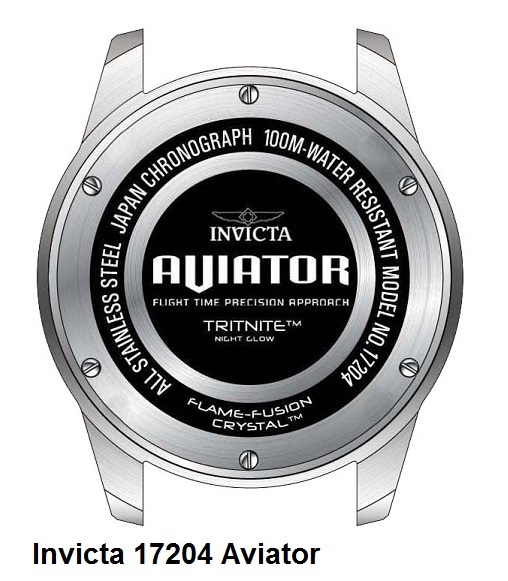 Invicta 17204 is powered by Japanese TMI VD57 quartz chronograph movement. This stylish watch also features a shiny sunray gunmetal dial with white accents black luminous skeleton hands and hour markers along with the chronograph and date display functions, scratch resistant flame fusion crystal and water resistant to 100 meters. Invicta 17204 is equipped with a 24 mm wide 16006 solid stainless steel bracelet with a fold over safety lock clasp. 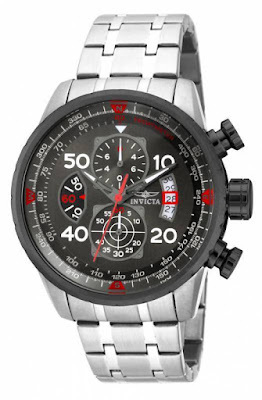 Invicta 17204 men's Aviator chronograph gunmetal dial stainless steel bracelet watch is brand new and comes in an original Invicta gift box and is backed by a 3 years limited warranty." 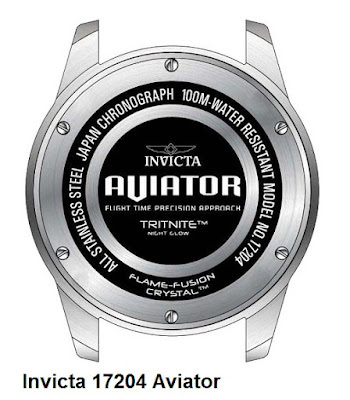 Well, I am not sure how much exactly is the real price for the Invicta 17204 Aaviator watch but it it is a beautiful piece of jewelry and I believe it is worth the money. To find out more about it please visit the official manufacturer product page.